OK, so reviewing the seventh book in a series is kind of silly. Those who haven't read the series don't care because they don't know the characters and don't want to be spoiled about plot developments from the preceding books. And those who have read the series don't care because, well, they read the first six, so why on earth wouldn't they read the seventh one? 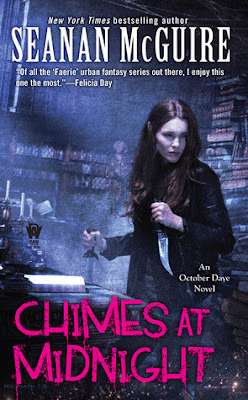 So, I'll make this brief: Chimes at Midnight, the seventh book in Seanan McGuire's October Daye novels, is a top-notch addition to the series. I'm thrilled to report that the characters and plotlines show no signs of Anita Blaking (AKA devolving into embarrassing, uninteresting shadows of their former selves). Chimes has McGuire's trademark humor; high stakes for the tough, likeable heroine; and acts of bravery, betrayal, and derring-do. In this new outing, Toby faces unexpected resistance when she tries to get the deadly goblin fruit off of the streets of San Francisco, and she calls upon her usual allies for help. Chimes reveals secrets about a few characters, one expected but still welcome and others quite surprising. McGuire does a fantastic job of recalling previous characters and storylines, allowing past events to affect the characters in their current situations and allowing the people in her series to grow and develop. My only criticism of the book stems from McGuire's weird obsession with coffee drinking (a similar theme also pops up in her Newsflesh series as characters guzzle down Coke). We get it; Toby likes coffee. This quirk was used to good effect in Chimes' storyline, but man, would I like to read fewer descriptions of coffee addiction the next time around. Another concern I have comes from a development at the end of the sixth book, Ashes of Honor. Toby has entered into a relationship with Tybalt, the local King of Cats, and in Chimes, they are sweet, passionate and occasionally a bit schmoopy. I hope Tybalt can remain happy in a relationship without becoming a declawed housecat. Despite those two small hiccups, Chimes at Midnight is an overall excellent book. Events in the final chapters have me extremely eager for the next book to see how these changes reverberate throughout Faerie. The highest praise I can give a series that's flirting with double digits is that I cannot wait to see what happens next. Heh. As a non-coffee drinker, I felt your pain. But I think in this case it was a plot point when suddenly Toby loses all interest in the stuff. So...I can understand it being overdone, in that case.